Notification with the passing of Northwest/Delta pilot Captain Robert Blane Cromer, nearing his 59th birthday. The only available information that I have is the obituary below....if you have more information to share, it is always appreciated. Bob Cromer of Westfield, WI passed over on March 11, 2017, after a heart attack at home. He is survived by his wife, Rene (Mrkvicka); stepdaughters, Tiffany Hildebrand (Mark) of Verona, WI, Heidi Yoder of Monroe, WI; brother, Rev Steve Cromer (Geneva) of Rock Hill, SC; and sister, Karen Huminski (Dr. Mark) of Greer, SC. He has six grandchildren, Lucas, Dylan and Colton Hildebrand of Verona, WI and Chloie, Waylon and Swayzie Yoder of Monroe, WI. Bob was preceded in death by his parents, Gladys and Leland Cromer Jr. of Spartanburg, SC. He was born March 28, 1958, in Maryland and lived in Spartanburg, SC until college at NC State where he received a BS in Aerospace Engineering. He earned his MS at USC. Bob was an F-15 Pilot in the USAF and retired LT Colonel. 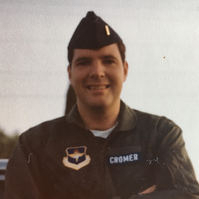 He received numerous USAF Commendation Medals, was awarded Squadron Flight Commander of Year (1989) and Squadron Instructor Pilot of the Year (1988). Bob earned the titles of Undergraduate Pilot Training Distinguished Graduate, Top Contact Pilot and Top Officer during his training. He was also an instructor pilot for the T-38 and F-15. Bob was a Captain for Delta (Northwest) Airlines for 10 years where he flew the A320, DC10, DC9 and 757. He also flew for Private Jet Airlines as a Captain on the MD80 prior to Delta. Bob's hobbies included flying model rockets and RC airplanes, and brewing beer. He became a certified beer judge while living in Minnesota and enjoyed attending microbrew competitions. He and his wife enjoyed traveling, hiking and camping until he suffered a severe stroke in 2004. Bob requested a private memorial service with interment at Arlington National Cemetery. After living with global aphasia for 13 years he developed a strong desire to help others with speech disorders. A memorial has been established for his special needs grandson, Colton Hildebrand, and the Madison Aphasia Group. Memorials may be sent to Bob's home address, W7134 County Rd CH, Westfield, WI 53964.